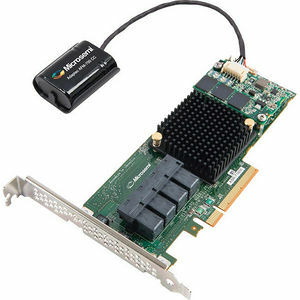 Adaptec 2274600-R BY PMC 71605Q SAS/SATA 6GB/S PCIE GEN3 RAID ADAPTER INCLUDES MAXCACHE 3. The Microsemi Adaptec Series 7Q SAS / SATA RAID adapters, with maxCache 3.0, deliver evolved application acceleration benefits with the industry-first read caching solution and support for fully redundant SSD write caching. Microsemi Adaptec's 71605Q and 7805Q adapters can deliver up to 25x improvement in IOPS and 25x reduction in latency compared to HDD-only storage arrays.